Schwannomatosis (MIM 162091) is a condition predisposing to the development of central and peripheral schwannomas; most cases are sporadic without a clear family history but a few families with a clear autosomal dominant pattern of transmission have been described. Germline mutations in SMARCB1 are associated with schwannomatosis. We report a family with multiple schwannomas and meningiomas. A SMARCB1 germline mutation in exon 1 was identified. The mutation, c.92A>T (p.Glu31Val), occurs in a highly conserved amino acid in the SMARCB1 protein. In addition, in silico analysis demonstrated that the mutation disrupts the donor consensus sequence of exon 1. RNA studies verified the absence of mRNA transcribed by the mutant allele. 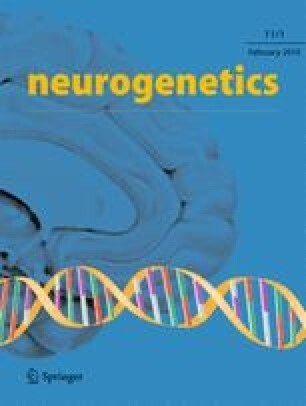 This is the first report of a SMARCB1 germline mutation in a family with schwannomatosis characterized by the development of multiple meningiomas. Costanza Bacci and Roberta Sestini equally contributed to this work. Funding: This work was supported by Children’s Tumor Foundation (contract grant number: 2007-02-003).